This is very unique, it's the perfect green green, I say this because most greens look bluish on me. 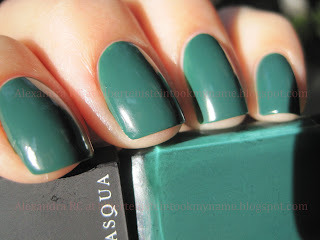 Kink on my nails was exactly the green you see on the bottle, and what I really wanted it to be. This might sound random, but I totally love the smell of the rubbery cap on these nail polishes, it reminds me of an eraser I had when I was a little kid. Needless to say, this varnish is very festive and appropiate for the holidays! 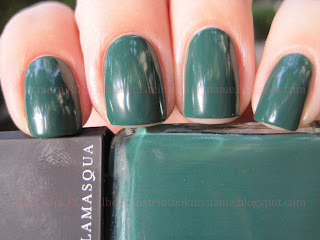 Also, check out my guest post of the complete Illamasqua Theater of the Nameless Collection at KarlaSugar's. 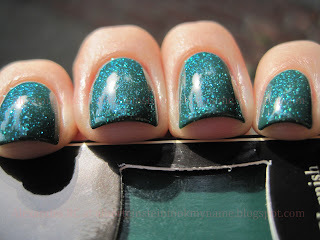 BONUS PICTURES - Illamasqua Kink with 2 coats of BB Couture Diamond Dust! Colors are beautiful and perfect! Ack I love this combo! So gorgeous! @ Polish AMOR: thank you! It's a green green? What the heck does that mean??? I have this and LOVE it-it really is a pretty one! Super pretty!! And the glitter is fun. I found you through a guest post on KarlaSugar. @ Fingers: a true green, because most greens lean blue on me! @ Kaki: Oh really? OMG isn't she amazing? I love her blog!